I felt a bit sorry for Jeremy Hunt when he decided to enter battle with Stephen Hawking over his bizarre NHS claims. It reminded me slightly of the scene in the final Harry Potter movie, where Harry strolls over to a salivating Voldemort having accepted the necessity of his death. There was no way Mr Hunt was going to look good by engaging with the country's most admired professor. And given his default association with the alleged collapse of the NHS, popular praise isn't something that he can expect to be met by very often. I must admit that I quite like Stephen Hawking. I certainly have huge respect for him. How could anybody not be moved by his incredible story? I am not somebody who sours on another person over political differences. I've met some pretty awful and especially stupid Leave voters since becoming politically active a few years ago. If Professor Hawking supported remaining in the European Union then more power to him. I can understand his Brexit fears, given the grants afforded to British science from Brussels. Hawking and I also disagree on the question of whether the country perseveres with the NHS or not. It needn't be cause for any sort of contempt. "I wouldn't be here today if it were not for the NHS. I have received a large amount of high quality NHS treatment, without which I would not have survived. I have had a lot of experience with the NHS, and the care I received has enabled me to live the life that I want and to contribute to major advances in our understanding of the universe. We cannot afford not to have the NHS." He then went on to say that he believed the UK was slowly creating a 'US-style insurance system', and even more contentiously, that a publicly run, publicly provided would be the 'most efficient' solution. I believe that there is some merit to the former of these two claims, which is especially worrying when one considers how privately and publicly expensive and thus unfit for purpose the American healthcare system is. The second of Hawking's two claims, however, is simply not true. 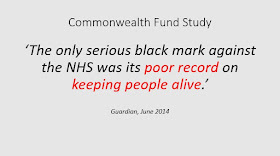 I don't mean to cherry-pick evidence, to borrow one of his phrases, but only the latest Commonwealth Fund study, referenced in the linked BBC article, ranked the NHS as one of the worst performing health systems in terms of patient outcomes. It's not an anomaly either. 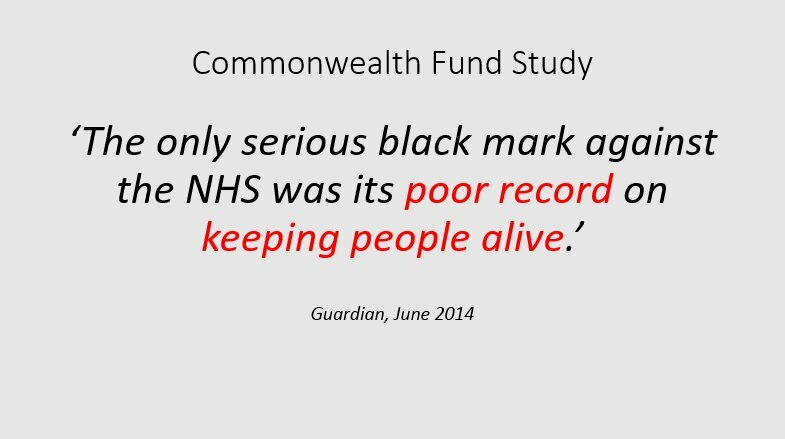 Previous such studies (always twisted as positive because the NHS tends to score well in categories like 'equity' or 'value for money', which aren't as important) have raised similar doubts. There are efficiency problems which necessarily accompany big, bloated, bureaucratic systems. These issues lead to longer waiting lists and inferior results when combatting serious illnesses, an issue Bow Group have produced a fair amount of research on (such as this policy paper). In fairness to Hawking, who knows all about serious illness, I am sure he has access to excellent treatment which makes his condition somewhat manageable. But a void of market forces means this will not be the case for large parts of the country. Poorer individuals and regions are more likely to struggle with access to treatment and suffer worse outcomes. But, it is the original quote indented above which I am much more interested in. Hawking makes the bizarre claim that he would not be alive if it were not for the NHS. I think he is fundamentally disregarding the existence of alternate and high quality private healthcare available all over Europe and in pockets of the Middle East and Asia. I speak as a non-scientist, but I am more than capable of reading authoritative studies, as well as the interesting picture painted by international rankings. The Lancet medical journal's findings, for instance, had the NHS in a very average position relative to global performance, backing up the well-known WHO study back in 2000 (when Labour were in power), which had Britain's healthcare system in 18th. It is not like Britain has never known a more private system. Prior to the National Insurance Act of 1911, introduced by David Lloyd George, which 'provided for the compulsory insurance of lower paid workers and set a fixed capitation fee for doctors', healthcare was administered through what were called 'friendly societies', where workers would get together collaboratively, in miniature, socialist arrangements, and fund the services of a doctor collectively. Yes, we've moved on, both in terms of research and technology, but history shows healthcare needn't be complicated or provided by ministers. The other issue I have with Professor Hawking's comments is that they essentially capture the nauseating emotional connection that Brits have with healthcare provision. It is odd because healthcare needs are, by their very nature, private and oughtn't represent bargaining chips for politicians at election time. 'Groupthink' surrounding the NHS is rife and poisonous. I particularly loathe the term 'our NHS'. In using it we promote unhealthy tribalism, which blockades against meaningful debate about how we improve a stagnant system of healthcare. Diluting this poisonous emotional attachment is perhaps the first step to achieving a market-based system, similar to those seen all around the continent. Increasingly, academics believe that, almost by right, they are entitled to transfer their authority in a particular field to other fields, often for the sake of making noise and boosting their own public profile. This became especially apparent during Britain's referendum on European Union membership. Of course, I am not saying that academics should not have the right to speak and be heard. Nobody values the importance of free speech more than I do. The issue is that by association alone they are afforded disproportionate exposure and their words a special (and often unwarranted) significance. This is damaging to debate as it promotes laziness and useless conventional wisdom. Professor Hawking does, it is true, have extensive experience as a recipient of NHS treatment, and as a fellow human being I can only sympathise. But this should not enable him to lie at respectable conferences about which models of ownership are best for the UK. Sympathetic and respected figure or not.